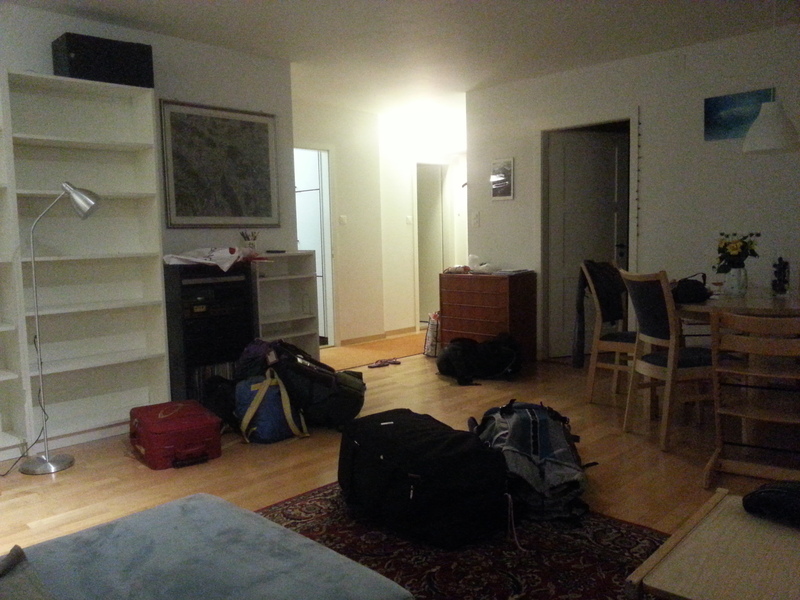 Our flat looks very empty but is very much home. My last blog from the journey itself. In Nizwa we had to visit the fort of course. 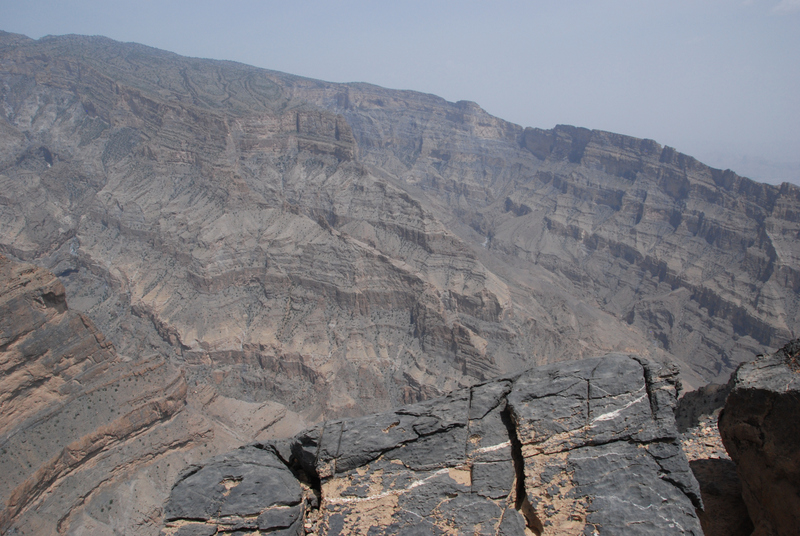 But my true wish was to drive up to Jebel Shams as far as possible through the “Grand Canyon”. The description we had from our book or from the internet turned out to be quite inaccurate. 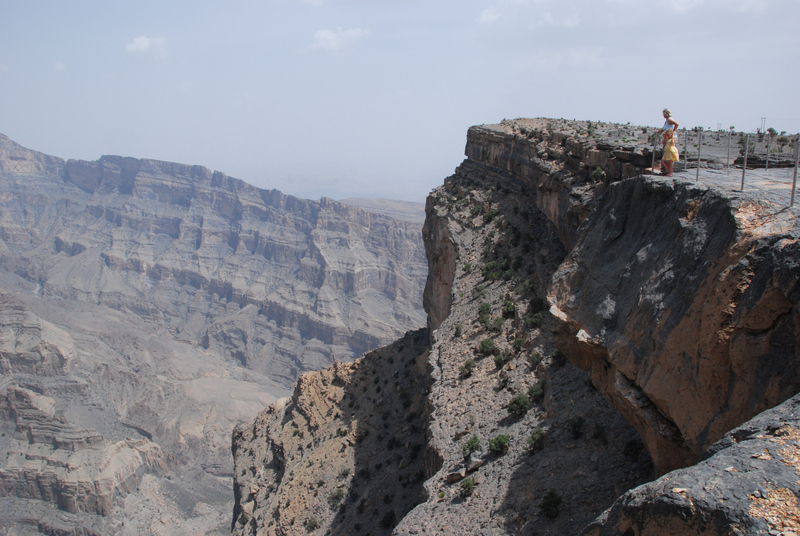 You cannot drive through the Grand Canyon but rather one drives almost up to the Jebel Shams and then turn right. 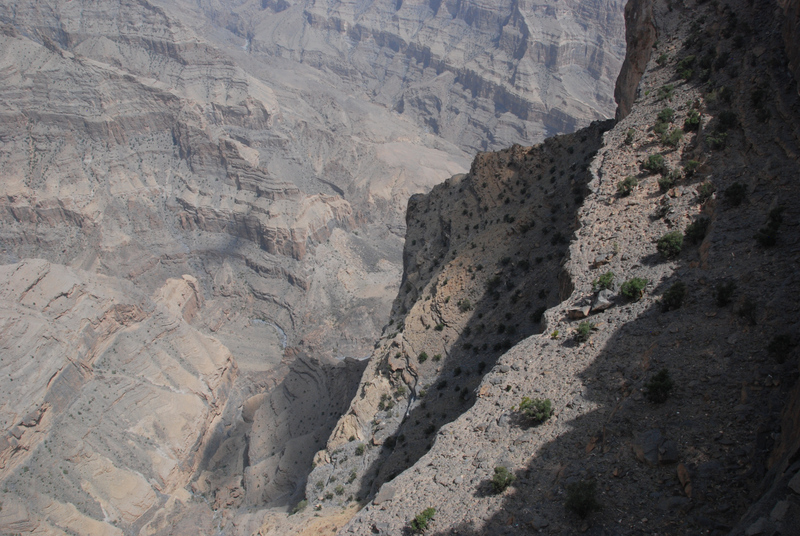 The road then ends on Top of the Canyon some 1600 m higher than the start. Also the road was marked as graded (i.e. unpaved) but was a 2 lane paved road for the most of it. 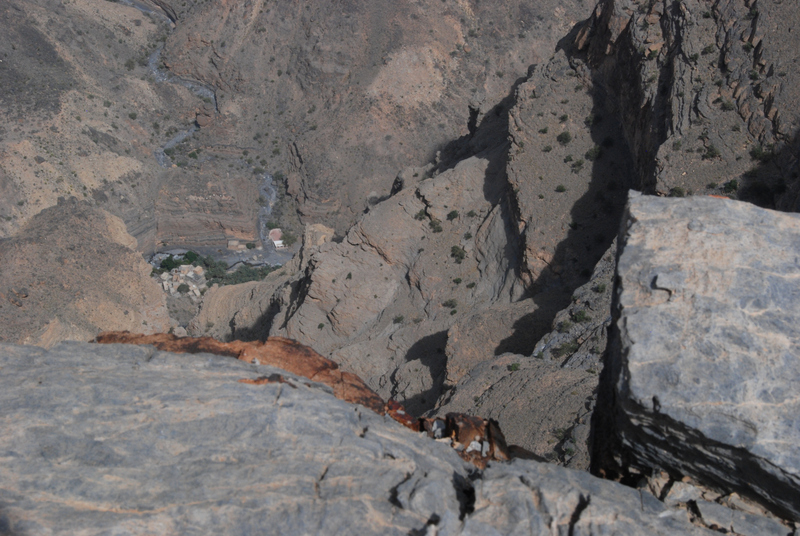 The road actually goes up to the very top of Jebel Shams, the highest mountain in Oman, but that is closed to public because there is a radar station there. There is a hike of 6 hours to reach the top (open to public). There and back 12 h. Next time. Anyway, it was worth the drive. Very neat landscape, much cooler up there, from 45 down to 35. 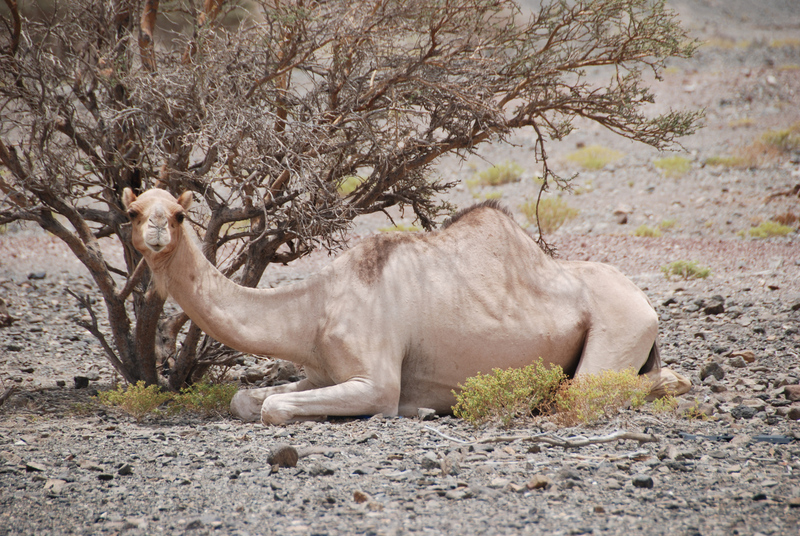 Next time we would probably stay in Jabal Shams Heights Resort in a tent (with heater and AC). Here on the left, where it is green, an abandoned village between two walls. There even is a small lake. (see later in text to this). 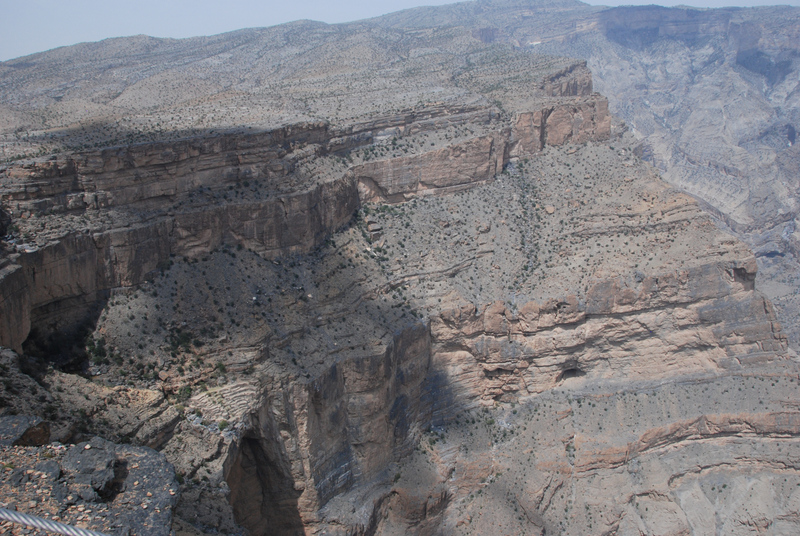 There even is a place where Nakhr can be seen, some 1200 Meters below. There is a track from to bottom valley up there (W6a) and another one right through the canyon to that mentioned abandoned village. That second stage (W6) we really wanna do one day. Looks awesome. See Sketch Wadi Nakhr for details. Back down at Ghool (see link above) we decide to give it a try and drive into that canyon from below, as there were tracks in the Wadi. Nothing on google, a good sign. and we almost got stuck. There was a right turn to leave the wadi for a road that we missed, and the drive-able part ended abruptly with a lot of loose gravel and water. The car beeped like crazy but we managed to pull free. The road then ended after a small village. Kids up to 10-15 Years are allowed to eat and drink. There are however, no restaurants open till 19:00. Hotels with Restaurants may have open, but we didn’t find any. 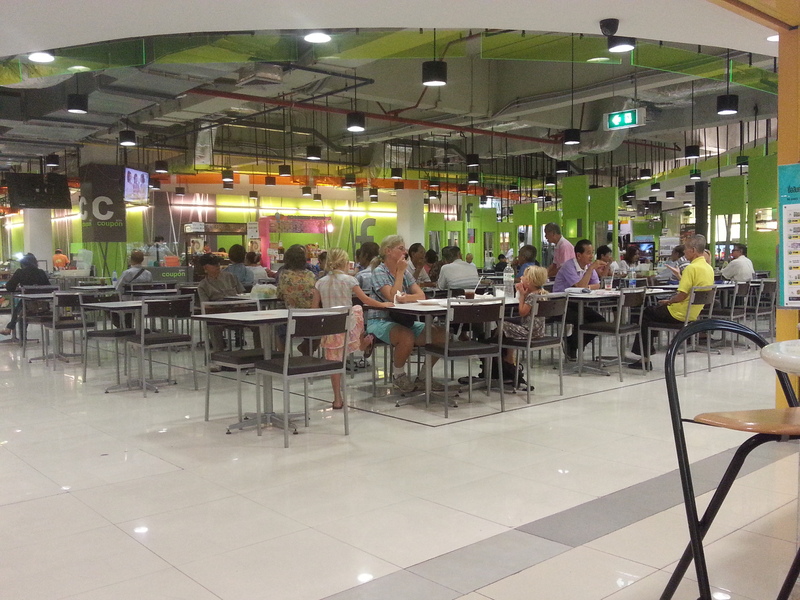 So what to do: Go to Lu Lu Hypermarket and by in panic lots of food that does not spoil in 40 degrees. That is what we did and so we now might have to carry UHT milk back to Switzerland. No problem, we have 30 kg baggage allowance. Only about 10 years old and made from marble. 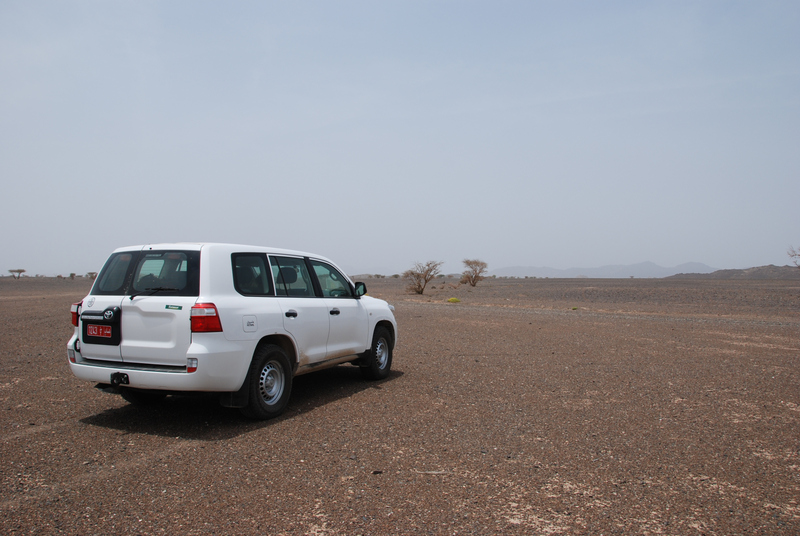 According to guide books you need a 4WD (4×4) to do Oman properly. I thought to be on the save side we do so. Strange: it is actually difficult to find a 4WD on the car rental companies websites. They have them but you cannot search for them and even if you open the cars description, is is not mentioned if they have 4WD. Very weak service indeed. From Muscat we drove to Sur and finally Ras Al Jinz. We made a stop at Bimmah Sinkhole. We saw a snake that could actually creep on the ceiling of the cave. 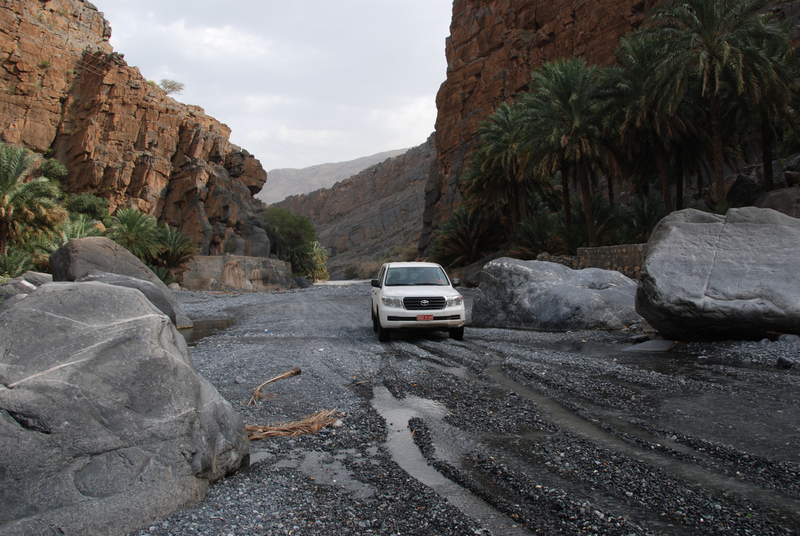 Well, with a 4×4 you need to drive through a Wadi. 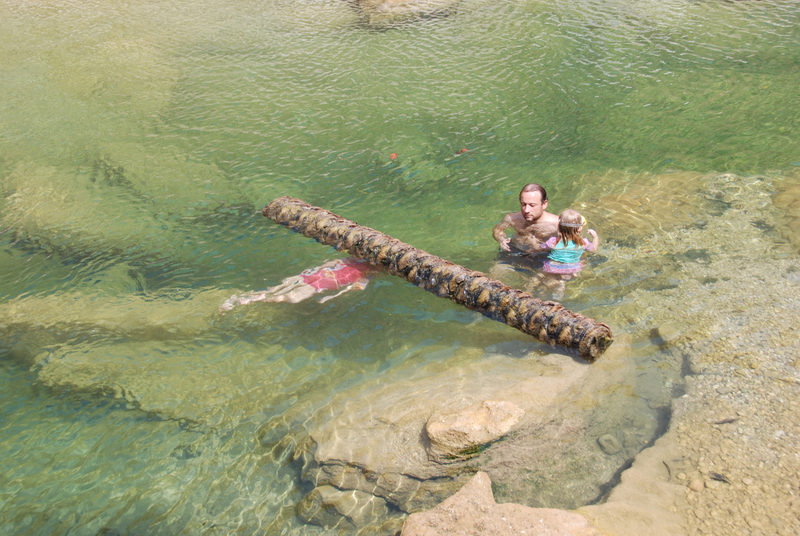 The Wadi we choose, Wadi Tiwi, was not quite as we expected. Rather an Oasis. And the road was made from concrete, very narrow and steep though. 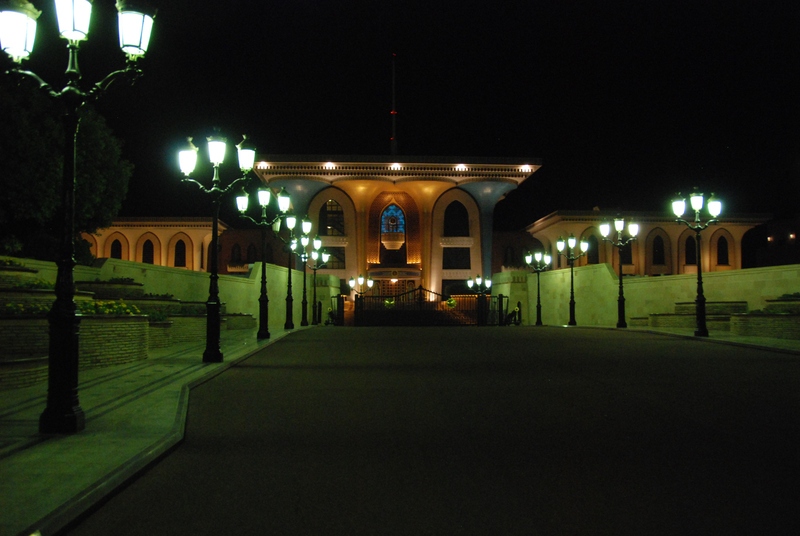 Qalhat was close to visitors. That was quite strange. There are paved roads to everywhere, but not up that famous monument. We passed Sur and arrived in Raz Al Jinz. That is where the picture from the Tent blogs are from. 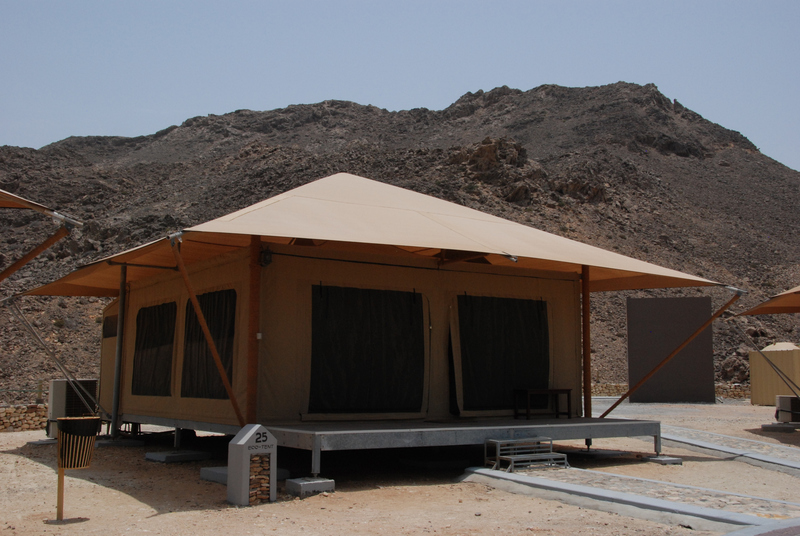 The tents are acutally marked with “green technology”. The window was open (i.e. 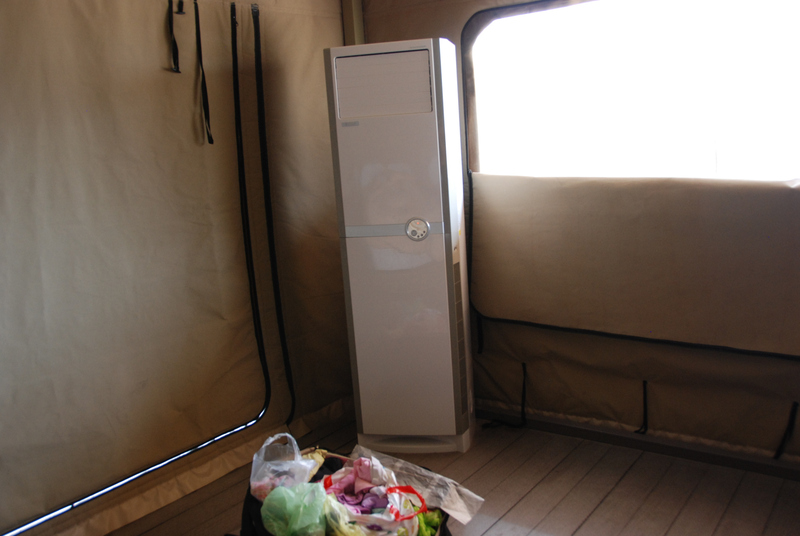 only a mosquito net there) and the AC was a full speed. Fortunately it was cold enough to sleep without AC. It can get down to 15 degrees in August there, thanks to monsun. 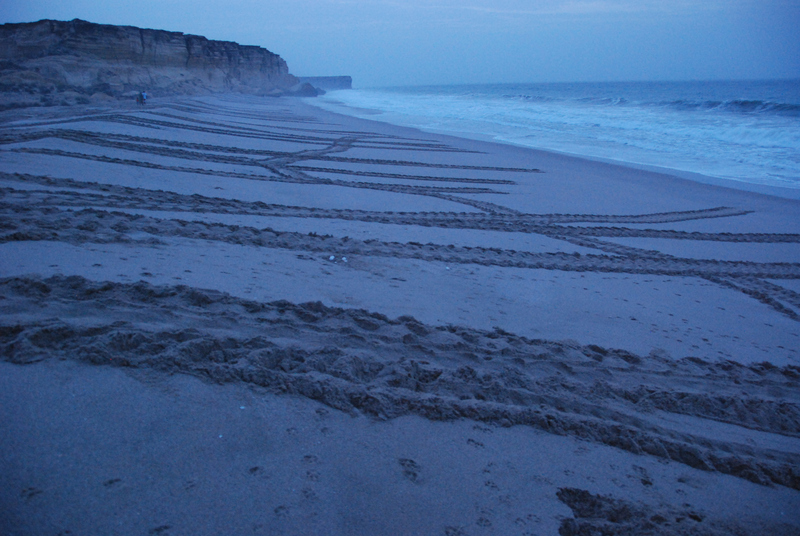 Tracks from some beach sport? 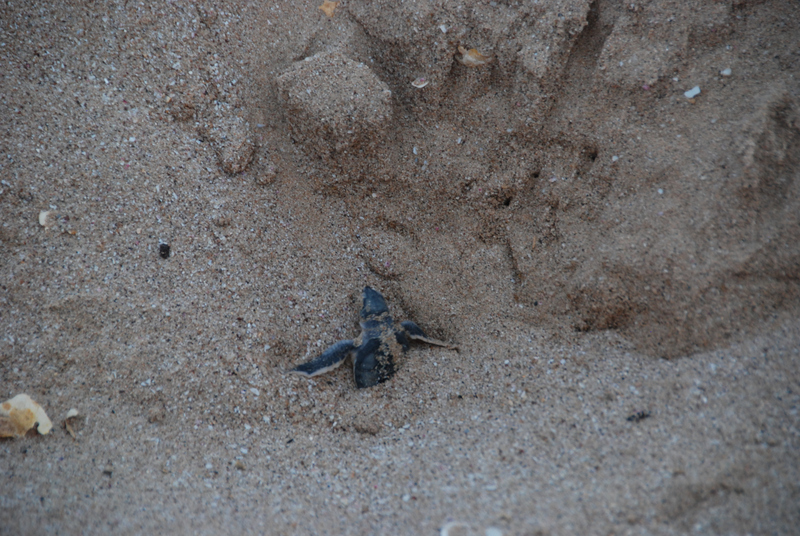 No, it is a green turtle nesting resort. We made the evening tour at 21:30 (were in bed 23:30), no pictures allowed, and the very early morning 4:00 tour. After sunrise pictures are allowed. 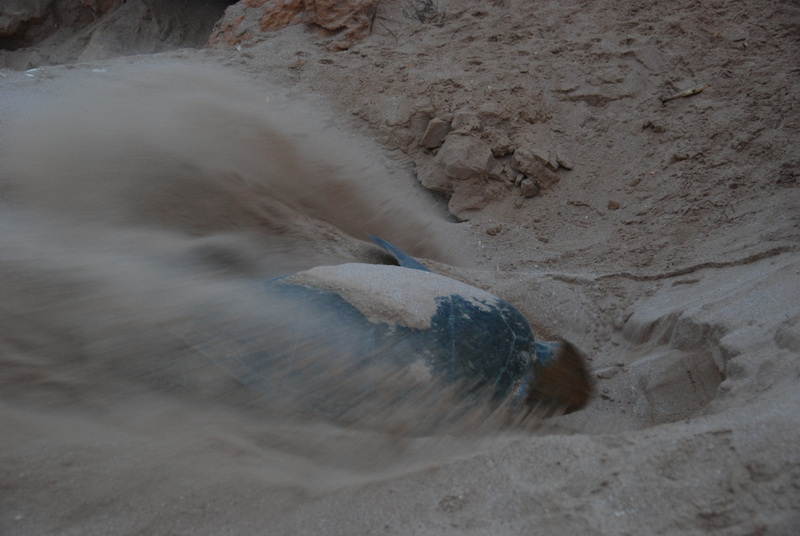 We saw all stages, coming to the beach, digging a pit, laying eggs, covering stage I and II, going back to the sea and hatching including a fox trying to eat some. Really great. We then went to sleep again and had breakfast 9:30. We all were very tired the entire day but had to move on to Ibra. 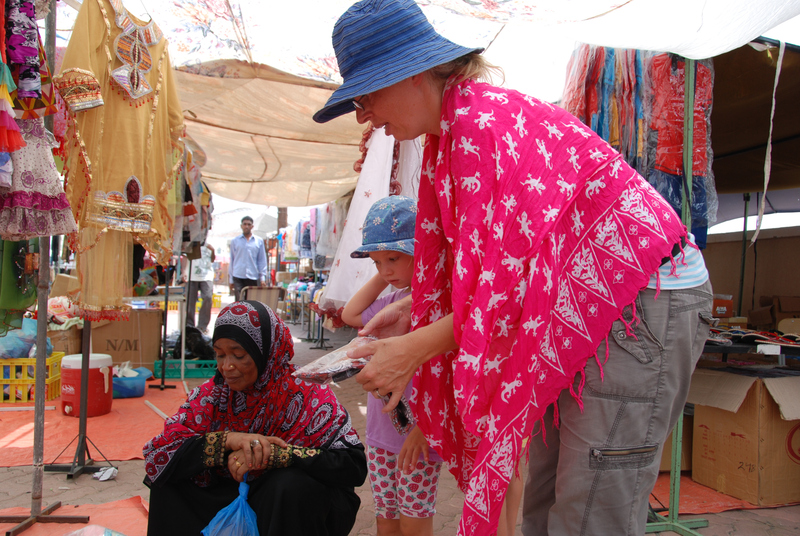 The next day we went to a Souq. Shopping and haggling at 40 Degrees. Like being back in Australia, 44 degrees, but in pastel (instead of red). The roads are very good everywhere. And even 100 km through the semi-desert with no one living there the roads are illuminated. That really is stupid. I tried to find a connection road that was not paved, took me several tries on the smallest roads on the GPS till we finally found a 5 km off-road stretch. Now in Nizwa for 2 night. The very last stage of our journey. 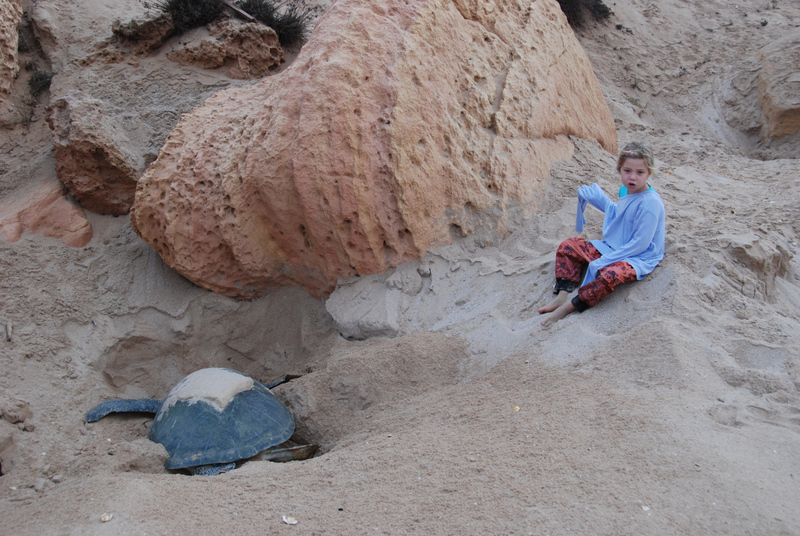 Well, it is turtle nesting peak season and the hotels are completely empty. Bad thing: Some are even closed. We finally found an ideal tent for our camping site at Greifensee. Unfortunately it is slightly bigger than allowed. Thus we have to file a request so that we get a permit. Good chance to get it, as we know the president. That is why text below has to be in German, a copy of our letter to the chief assembly of the Genossenschaft (Cooperation). Answer see end of this blog. Endlich haben wir ein ideales Zelt gefunden. Mit den Massen 6.2 x 6.2 m (ohne Dach) nur etwas grösser als erlaubt. Sturmfest und wüstenerprobt. Der Spezialstoff isoliert. Für die Klimaanlage bräuchten wir noch ein Stromkabel. Für eine Ausnahmebewilligung danken wir im Voraus. Answer to the question above. The day only really started when the guy at the Oman Air Check-in asked for our Oman Visa. Well, after the LA incident (never fly NZ Air!) I had not only double but multy checked every country. Swiss do get a VOA (visa on arrival). So when he asked I was quite startled. So I told him and he never asked again. Phuuu. They have a clever system at Bangkok Airport. You have to show boarding card BEFORE the waiting area by the gate. So once the actual boarding starts, it is fast. Why do not all have it like this? Needs more space probably. Changed all my THB in $. Once done, Astrid and the kids decided to finally buy that frog at a typical completely overpriced airport shop. All $ gone. So we finally escaped the Bangkok Tailors. I am probably the only tourist that goes to Bangkok and buys shirts from the rack at a price close to what they cost in CH. We were just cheated too much. If you ever try to buy a tailored suit in Bangkok please reserve 4 days and do a lot of research beforehand. And below 200$ must be crap. 400$ seems to be more reasonable. The Pilot announced that public eating and drinking is forbidden during daytime. Yes, it is Ramadan, we had no clue. Restaurants all closed, exception at Hotels. Our Hotel does not have a Restaurant. Sorry guys, I am so tired after a full day shopping, no energy for a decent blog. A search pic instead from one of the malls, China Land or so. Count the number of caucasians on the picture. Now some trivia. The comodo dragon is the biggest lizard in the world and people spend a lot of money to see them in the wild. 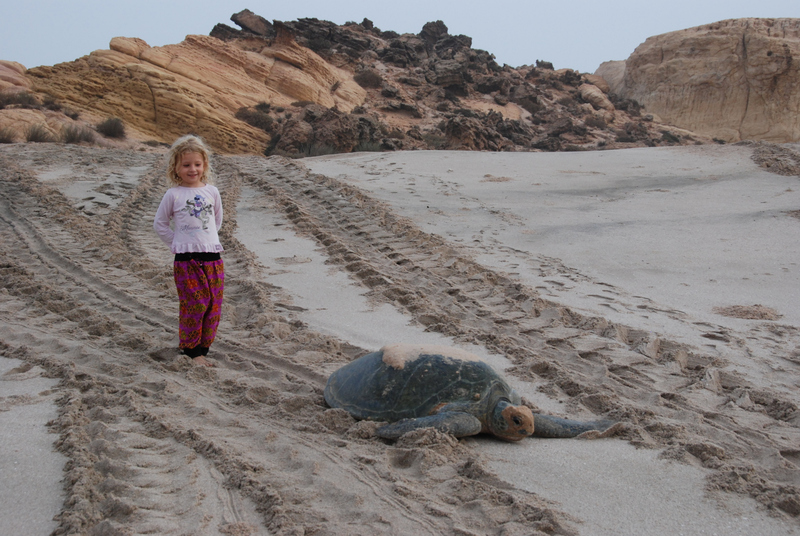 Where can you see the second biggest lizards in the world and people do not even notice them and the “advaced tourism” industry does not advise them? Bangkok? You bet. We saw about 7 of those monitor water lizards and they were huge. The biggest about 2.5 m / 50 kg. When I fist saw one crawling out of a sewer pipe I briefly though the urban legend about crocodiles living there were true. The other tourist longboats just rushed by to see some 08-15 fishfarms.